For the Soho Coffee Co. reducing energy consumption is one of its goals and so the company is currently trialling air intake filter screens in the UK cities of Cheltenham and Bristol. Keeping food and drink cold is a major cost for retailers. Poor maintenance results in up to a 10% increase in energy use. One of the major causes of refrigerator inefficiency or failure is dirty or clogged condenser coils. This results in restricted airflow throughout the system and will require the refrigerators to work harder and consume more electricity in order to maintain the optimum temperatures necessary to avoid food spoilage. Here, we see how one air-intake screen specialist. It’s not just the smaller sized high-street chains of coffee and sandwich shops that are affected by refrigeration inefficiencies. 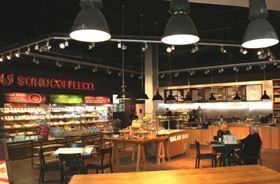 Research from the Journal of ‘Applied Thermal Engineering’ suggests that the UK’s retail food outlets are responsible for approximately 3% of total electrical energy consumption. Refrigeration accounts for a major percentage of in-store electricity demand ranging from 25% - 30% for larger hypermarkets to over 60% for food-dominant convenience stores. The report concludes that if those stores with above average energy usage reduced their consumption to industry-wide average levels through implementing energy conservation measures, then an additional 10% electrical energy savings could be achieved. This represents around 840 GWh of electricity and a reduction of 355,000 tonnes of CO2 emissions if applied to all the stores of the major retail food chains in the UK. Carbon Trust reports that refrigerated display cabinets are estimated to use a minimum of 5,800 GWh of energy each year. At current values, and with spiraling energy costs, this is expected to exceed £754m per year and will create a significant drain on the UK’s energy resources at a time when capacity margins are shrinking and warnings of energy blackouts could become a reality during winter 2014. In June 2013, during the annual Consumer Goods Forum (CGF) Refrigeration Summit in London, Climate Change Minister Greg Barker called on the UK’s major supermarkets to address the pressing issue of using costly, ozone-depleting chlorofluorocarbon (CFC) refrigerants. He urged the industry to step up its efforts to improve energy efficiency by adopting new refrigeration technologies. To help the industry in its efforts, a taskforce was set up to help unlock further potential energy savings in the retail sector. One of the quickest and simplest ways to improve energy efficiency and reduce energy consumption is to ensure a regular maintenance schedule for refrigerated display cabinets is carried out. It’s essential for condensers and evaporators to be kept clean and to ensure fans and defrost systems are working correctly. Further guidance from the Carbon Trust suggests that poor maintenance can increase condensing temperature or reduce evaporating temperature by several degrees, resulting in up to a 10% increase in energy use. The guidance also stresses the importance of avoiding any build up of dirt or debris on the air-intake components. Irregular cleaning schedules can potentially damage a refrigeration unit, resulting in downtime, loss of business and a hefty repair bill. In short, regularly cleaning condenser coils will maintain compressor efficiency, saving energy and money. Many specialist maintenance firms will of course recommend regular cleaning schedules. However, these can be expensive, particularly when a typical condenser may cost anything between £100-£500 to clean. Many refrigerated display units have a slide out refrigeration system containing a compressor, evaporator and condenser fans. This allows ease of maintenance and repair within limited and valuable floor space. These critical components and air intake fins are usually located at foot traffic level and are prone to clogging from airborne debris and dirt. To avoid expensive maintenance schedules and prolong the life of sensitive refrigeration equipment, many retail outlets are recognising the benefits of using external air intake filters. This allows regular retail staff to remove and clean them as part of their daily cleaning schedule. Air intake screens can be positioned on the outside of metal air intake louvres thanks to a unique magnetic fixing design. The filters then become easily accessible from the outside without having to pay engineers to have displays turned off and dismantled in order to retrieve them. In the US, Starbucks Coffee has installed energy efficient, self-contained, refrigerated, grab-and-go deli/pastry display cases throughout its stores. The refrigeration systems are designed to display food products at eye level, within easy reach, and house critical refrigeration components inside the base of each unit. Located at foot level, the refrigeration components and air intake fans were prone to dirt and dust brought in to the stores by customers. William Miko, the regional facilities manager for Starbucks’ metro New York found that clogged refrigeration coils were causing display temperatures to rise throughout his 300 busy stores. Without frequent cleaning, the clogged coils were causing costly compressor failures that led to loss of sales. Starbucks installed the air intake filter screens, manufactured by Permatron, as part of its preventative maintenance programme. Technicians from Starbucks discovered that the display units were running more efficiently and so much colder, that they were able to adjust the refrigeration so that it consumed less energy. The air intake filter screens have proved so effective that Starbucks is now installing them on its ice-making machines. Having heard about the benefits, several other food and drink outlets closer to home are now trialling the filters across their stores. Soho Coffee Co. is an independent, privately owned, Fairtrade business with 24 stores throughout the UK. The company prides itself on its green credentials and is working on several initiatives with its partners to lower its carbon footprint. Reducing energy consumption is one of its goals and so the company is currently trialling air intake filter screens in Cheltenham and Bristol. With energy prices rising and businesses forced to make savings, retail managers from smaller high-street outlets through to major UK supermarket chains are looking at innovative ways to make cuts and reduce energy consumption. While regular maintenance schedules are essential for keeping equipment running efficiently, steps can be taken to reduce these costly regimes that may involve shutting down refrigeration equipment or carrying out expensive repairs during trading hours. Fitting external air intake filter screens will allow essential cleaning to take place without incurring the costs of specialist refrigeration firms. Clogging of air intake vents caused by outside debris can be avoided and help extend the life of sensitive refrigeration equipment.